IT IS REPORTED in the Greek language Cypriot press that the Auditor General (“AG”) wrote to the Attorney General on 22 March 2019 a letter in which the AG de facto asserted that the whole cause of the destruction of homes in southwest Pissouri is attributable to errors in structural calculations made by every single one of the 20 (or so) ETEK registered Structural Engineers who designed the substructures of homes in southwest Pissouri between 1980 and 2005. When did the AG himself visit Pissouri to view the destruction of homes, and what discussions did he have with The Village Council? Why does the AG refer only to the unstable area as “Lakes” (“Limnes” originally meant lakes or small brook or water spring) when a Committee of The House of Representatives recently identified that the whole of southwest Pissouri (about one million square metres) is unstable due to landslide? What action has the AG initiated to have “struck off” the 20 (or so) Structural Engineers who, he implies, have brought ETEK membership into disrepute due to “criminal” (AG’s reported word, not mine) wrongdoing? No reputable expert invited to survey southwest Pissouri has attributed the destruction of homes to design error. On the contrary: every reputable expert including the distinguished Cypriot Engineers Mr Petros Evlogimenos and Mr Costas Meletiou identified landslide as being the cause of damage; as did the world-renowned Geomorphologist Dr Gareth Hearn (supported by the Senior Geological Survey Department Official Dr Kleopas Hadjcharalambous); and The Geological Society of London by publishing “Damage Caused by Slow Landslide in Pissouri“. All these opinions have been confirmed incontrovertibly by InSAR satellite imagery. Experts analysing the 2001 Pissouri landslide (located immediately next to the present landslide) identified a causal link between that landslide and the surcharge of the natural aquifer under Pissouri. Dr Hearn stated that the probable cause of the present landslide in southwest Pissouri is uncontrolled ground water. The Government’s own experts, The Geological Survey Department of Cyprus (email dated 13 November 2018) attributed the cause of the landslide to the failure [of the state] to provide a ground water management system. Why does the AG assert, apparently, that all these experts are wrong? 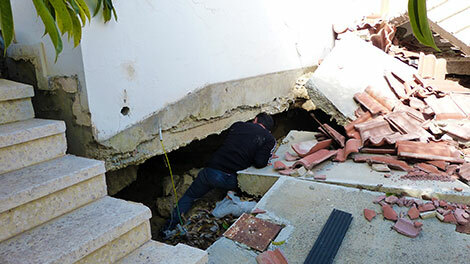 What is the causal link between structural calculations carried out in 1984/85 for a home in Kiminos Street and the 700 (yes, seven hundred) breakages of public water mains which occurred in Pissouri during 2018/19, or the 4 (yes, four) underground armoured electricity cables that sheared due to ground movement in just the last two weeks of March 2019? What is the causal link between structural calculations carried out in respect of my home in 1988 and the widespread collapse of public roads throughout southwest Pissouri in 2019, and is it the contention of the AG that the District Engineer designed such public roads with as much carelessness as amounts to negligence? Is the probable answer to all these questions that the AG has been improperly briefed, either carelessly or mendaciously, thereby damaging the reputation both the Auditor General himself and his important Office? For the avoidance of doubt: the issue at stake in Pissouri is not one of professional negligence by designers, nor even breach of duty of care by the District Administration (defence of which comprises a significant portion of the AG’s letter) it is common humanity. The residents of southwest Pissouri are the innocent victims of an uninsurable natural disaster (namely, landslide which was notified to the authorities seven years ago in June 2012). The residents have not sought to apportion blame or to blame anyone, they simply look to the Government of Cyprus to protect them from the consequences (including loss of their homes) of the uninsurable natural disaster, as is their right under Article 1 of Protocol 1 of The European Convention on Human Rights. I’m afraid that the recent landslides in both Pissouri and Paphos have resulted in my residence in Cyprus being cancelled. I was already to sell up here and find a home on Cyprus. I have spent a long time on the island but nothing like this has happened whilst I was there. I am sad as I am getting too old to move now but if people took their responsibilities seriously it would certainly be on the cards again, but not with the present reasoning. I had 12 months in Messogi and thoroughly enjoyed myself but I`m afraid it wont be repeated. With all these experts and their views, just go and ask any 75 year old plus person in Pissouri what the area “Limnes” is about and they will tell you exactly what the problem is there. The government is to blame and they should pay up and shut up. 1. It contains facts and logic. 2. It’s addressed to people who only care about themselves. It feels very much like the Cyprus government is trying to “time out” this problem. Waiting for the affected residents to either die or give up and go back to the UK isn’t the answer. Don’t let them get away with inaction. Ed: The government is doing its usual ‘blame game’.